Pictured is a rendering looking down on the proposed hotel and parking garage with North Union Street to the left and East Winter Street to the south. 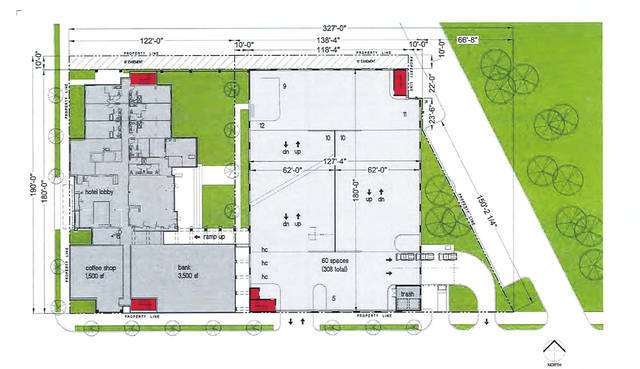 In dark gray is the plans for a hotel (northern piece), coffee shop (bottom left-hand corner) and bank (bottom right-hand corner). Shown in light gray is the parking garage. Pictured is what the proposed hotel and parking garage at the northeast corner of North Union and East Winter streets in Delaware would look like if viewed from East Winter Street. To the far left is the hotel, which connects to the east with a proposed PNC Bank (middle section of rendering) before moving east to the proposed parking garage. At the far east side of the garage (far right side of rendering) is the proposed PNC Bank drive-thru. The issue of parking in downtown Delaware has long been a concern for both residents and business owners. With remedies to the problem hard to conjure up, the feasibility of a parking garage has often been a speculation. But that speculation — and much more — could soon turn to reality if a proposal currently in front of the City of Delaware Historic Preservation Commission (HPC) is ultimately approved by Delaware City Council. The HPC will consider a proposal by Fairfield Inn and Suites by Marriott to construct a five-story, 104-room hotel on the northeast corner of East Winter and North Union streets. The hotel would face North Union Street and stretch north from the corner of East Winter Street into what is currently the parking lot for the City of Delaware Justice Center. In addition to the hotel, the proposal is asking for a detached four-story, 300-car public parking garage to be constructed directly east and behind the hotel, across from the Delaware County District Library building. Currently, a PNC Bank drive-thru building exists at the location. The bank would be demolished to make way for the hotel. 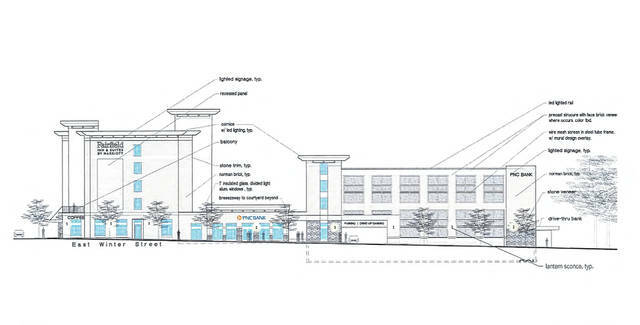 However, the proposal shows a 3,000-square-foot PNC Bank branch would be attached on the south side of the hotel. The parking garage would also have drive-thru banking access. Because the proposed buildings would be constructed within the Transitional Sub-District of the Downtown Historic District Overlay, the applicants are seeking a certificate of appropriateness from HPC. The commission will look at the design, material, and color palette of the buildings to ensure they are consistent with nearby buildings. According to city documents, the Justice Center and the Ohio Living Sarah Moore facility on the opposite corner of Winter and Union streets had the most influence on the design features of the proposed hotel, which would be mostly brick. Of course, meeting with HPC is just the start of what is sure to be a lengthy process. The parcels where the hotel would be constructed are currently zoned B-3 Community Business District, which does not permit hotels. City documents show a rezoning to the B-2 Central Business District would be necessary in order for the project to move forward. Variances in the city’s Architectural Standards would also be needed to accommodate the height of both the garage and hotel building. Per the standards, buildings constructed within the Transitional Sub-District are not to be taller than 2.5 stories or 35 feet. City documents suggest a change from the Transitional Sub-District to the Downtown Core be considered by both HPC and the applicants, although the standards for the Downtown Core only allows for buildings that are no more than three-stories tall or no more than 40 feet in height. Wednesday’s (Nov. 28) HPC meeting is scheduled for 7 p.m. at Delaware City Hall. The Gazette will continue to follow the proposal as it works through the development process.